There’s a stigma out there that if a film is “straight to video”, or now in our cases, “straight to DVD”, that it must be a pile of rubbish. Though there were always gems out there among the crowd that were worth watching, but alot because they were so bad they were good, though over the last 5-10 years, that trend has begun to change with some good, decent films heading straight to DVD. Undisputed III: Redemption stands out from the crowd without even breaking a sweat. The films begins with Uri Boyka (Scott Adkins), a once great fighter who’s incarcerated in Chornya Chomli, a Russian maximum security prison, spending his days mopping the floors with his make-shift broom. After winning a fight in his prison and impressing his warden, Boyka secures himself a position in an underground tournament that pits him against other inmates from all over the globe. The losers return to their prisons, whereas the winner will receive a ticket to his freedom, while the wardens try to win big by betting on their choice of fighter. The plots is pretty standard, but really, that’s not what we came to see. We really just want to see some badass dudes beat the absolute crap out of each over and we get that in spades. Scott Adkins makes a great leading man. He’s very solid as the hardened Boyka and very likeable as well, even if his Russian accent is just a little over the top, but that’s one thing that I really enjoyed about it, because, let’s face it, it’s not Shakespeare that we’re dealing with here. We’re just here to have a good time. Props also go out to Marko Zaror, who plays the very charismatic lead villain, Dolor. A huge man that towers over the well built Boyka and makes you wonder if Boyka even has a chance of beating the guy. Now let’s talk fight scenes. Bone-crunching, hard-hitting, blows that would knock your face into next week; these are some of the things that describe these very well choreographed fight scenes as best as they can, but they have to be seen to be believed. All shot without the use of CGI, wirework and fancy film tricks that plague a lot of bigger budget films these days. These scenes are the real deal! Showing us an incredibly talented bunch of guys laying us all out with some of the most authentic, ball-busting and downright coolest fight scenes put to film. The makers of the film obviously know how savvy people are these days when it comes to film making and that people have pretty much seen it all before. So what we get are some great, long, uninterrupted camera shots, showing us skill, incredible technique and that it is actually the main actors out there performing huge portions of these damn cool fights. Incredibly realistic and authentic, it’s almost like walking into the arena and watching them live for yourself. Now, not seeing the first two films, I can’t comment on how the film sits in the trilogy, but there’s no doubt that this film would make a great addition to the series. Though after seeing this now, I’m stoked to go back and see the first two films. It’s also a note to add that Boyka was actually the main villain in Undisputed II: Last Man Standing, now playing the lead in this, hence the subtitle; Redemption. Unfortunately, with this DVD release, there are no special features. It would have been great to see some behind the scenes features regarding the fight scene choreography. Maybe we’ll get some better releases down the track. 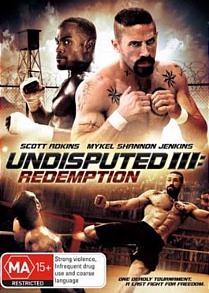 For a straight to DVD movie, Undisputed III: Redemption is a solid nights viewing that stands head and shoulders above the more generic, Z grade straight to DVD flicks out there, with a decent story, some good acting and some very impressive fight scenes. It’s one film that no martial arts film fan should miss, or anyone who enjoys a good fight flick. Undisputed III: Redemption really deserves to be seen. It’s one hell of a cool flick that just reeks of awesomeness!